One thing I love about summer? SWIMSUITS! There is nothing I love more than a cute little kini! I also find that I am a little more adventurous when it comes to picking out my suits. I love bold patterns and fun details (gimmie alllll the ruffles!). 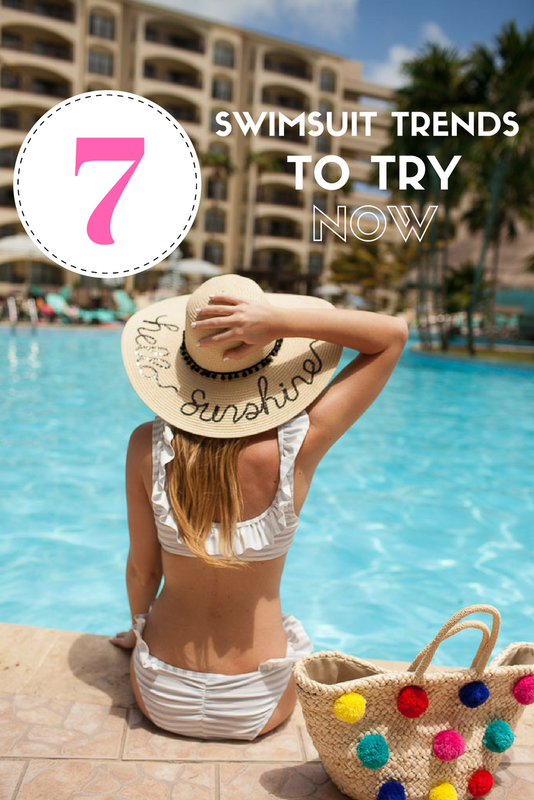 There are so many cute swimsuit trends out there right now that I’m sharing 7 of my favorites!! Like I said above, I am all about the ruffles lately, and what better way to wear them than on your kini?! I love a sweet ruffle strap or flouncy off the shoulder ruffle bikini top. It’s easy to pair a cute ruffle top with a pair of denim shorts when heading to the lake or beach! I’ve even seem some pretty cute ruffle-y one pieces that double as the cutest bodysuit! A lot of the suits I’m sharing below have a little ruffle incorporated! This trend has been around for a few years and I hope it is hear to stay! A high-waisted swimsuit is a great way to add a little more coverage but gives you a confidence boosting silhouette. I definitely loved having that higher waist on the beach in Mexico when I indulged in quesadillas and tacos!! A lace up one pieces has quickly become the must have suit of summer. Lace up tops have been all the rage for the past few months, so it’s no wonder it would take over the swimsuit scene too!! I love pairing a lace up one piece with shorts. 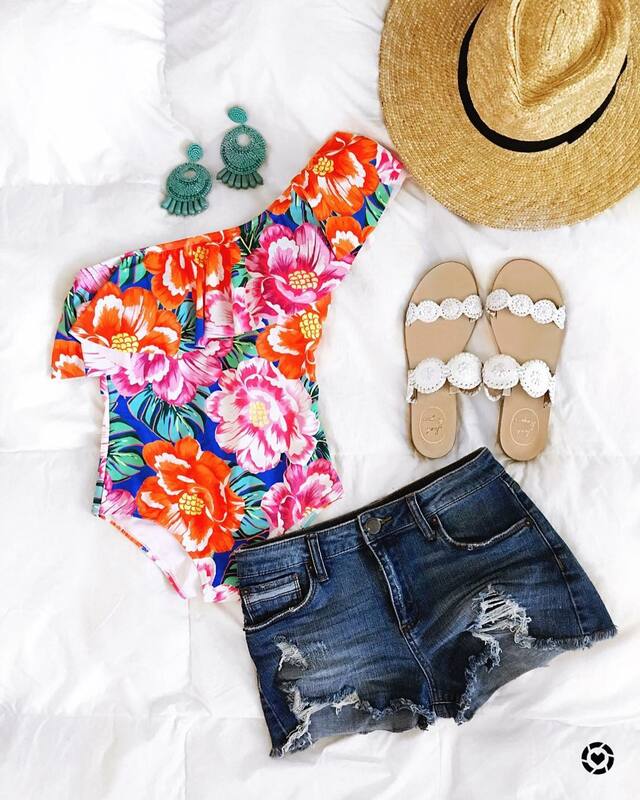 It doubles as a body suit and is the perfect outfit for a day spent on the water or at the beach. I am all for a fun printed suit! From fruits to bright prints and patterns, a printed suit is a great way to add a little whimsy into your summer wardrobe! I’m currently obsessing over this fun banana print suit and am thinking about throwing in this float for good measure. Summer fun at it’s finest! It’s all about showing off a little shoulder with these suits! There are so many cute off the shoulder and one shoulder options out there! I especially love an off the shoulder top when I’m working on my tan! One shoulder has recently made a pretty big comeback and I love a one piece with this fun detail! A suit with cutouts can add a flirty little touch to a suit! Cutouts on a solid bikini add a unique detail keeping the suit from being too simple. I personally love a one piece suit with cutouts, whether front and center or on the sides! This one is my favorite for the sweet bow tie detail above the cutout! Whether it’s just a crocheted trim or the whole suit is crochet, this is one of my favorite trends! There are some GORGEOUS crochet suits out right now (like this one) that take this trend to a whole new level of beachwear! 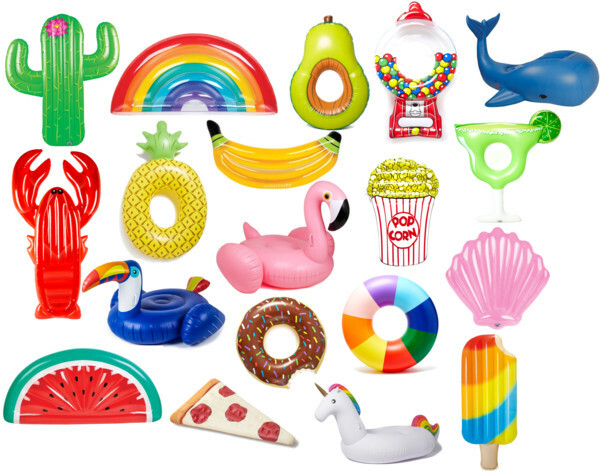 No day on the water is complete without a fun pool float! Check out a few of my favorites below…just click to shop! All of these are so cute! I love the different colors and styles! These are just the cutest!! I love all of the tassels and oh my goodness, that watermelon/scalloped bikini! IN love! I would love to try all of these! They are so cute! i so wish my mom bod could rock a 2 piece haha!! I am obsessed with that first swimsuit!!! they're all amazing though!!! Ah the one shoulder look is just so darling and I love how you can easily throw on some shorts and make an outfit out of it! Thanks for putting a great list together! You look so fantastic in all of them! My favorite is the floral print one with the ruffle hem. Thanks for posting! I always have trouble keeping up with what's "in" and "out" of style so this post definitely helps with that. I love the high waisted trend. These are all super cute picks! I am all about the high waisted right now! Yessss, love all these styles! high waisted & lace up are my jam right now! I tried high waisted last year and it failed with my short torso, haha. I'm trying ruffles this year! WOw you totally rock the high waisted swimsuit! Absolute perfection! I'm obsessed with the high waisted style! You are SO CUTE!! You look great in all of these swimsuits! Especially love the watermelon print! Super cute!! I'm loving all these swimsuit trends. I want a high waist bottom with an off shoulder top. I love a good high waist or one piece swim suit! Such great picks! LOVE all of these trends! I'm all about the cutout suits this summer. Thanks for sharing all of these swimwear tips. You have so many cute swimsuits!! Great roundup! Okay, you are seriously making me want to go swimsuit shopping!!! I live in Florida, so wear swimsuits all year round…. have a bit of an obsession!!! Every single one you posted is SO cute!! What a cute post! I love all of these suits..Im really into the high waist trend, but they dont look so great on my thighs! What was the website for the black bikini with the neon crochet!! It’s so cute but url isn’t seeming to work!